The tundra of the Churchill Wildlife Management Area in Manitoba, Canada has just begun to receive its colder temperatures as the area has a thin layer of snow on it. A polar bear decides sitting for a short while will rejuvenate him to make the trek to the Hudson Bay coastline to find any signs of food. As cute as this Polar Bear looks sitting quietly by himself, one should never approach these wild animals as they should never be taken for granted due to their massive size and strength. 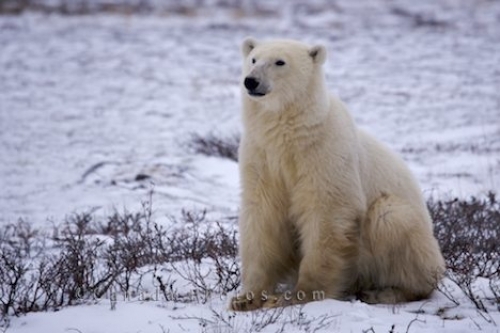 While on the tundra buggy tours, this Polar Bear makes things easier for the tourists to capture his photo. Picture of a cute Polar Bear sitting peacefully on the frozen tundra in the Churchill Wildlife Management Area in Manitoba.